It's time to stand up and say enough is enough. Since Jair Bolsonaro's election, violence and attacks against Brazilian Indians have increased drastically. This Thursday, indigenous people across Brazil will be protesting, and they're calling for international support. Survival stands in solidarity with them. Help us show Bolsonaro that the world is watching. SHARE messages from indigenous people far and wide. Help us ensure their voices are heard. 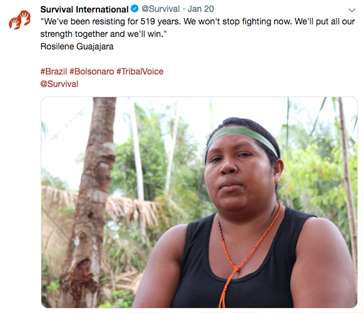 SHARE Survival's response to Bolsonaro's "declaration of war" against Brazil's indigenous peoples. 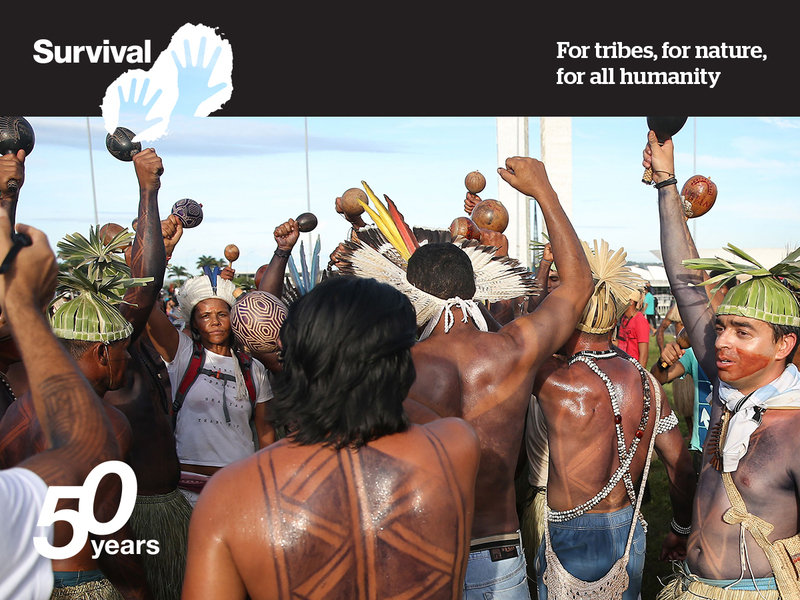 FOLLOW Survival on Twitter and Facebook to be alerted every time we broadcast the voices of Brazilian tribes. We post daily from @Survival and @SarahDeeSvl. JOIN US at 9am this Thursday 31 January at the Embassy of Brazil in London, UK. Bring yourselves and your friends as protest alongside indigenous people across Brazil. I'll be there! Details please And please, help us spread the word by sharing this email with your contacts. We'll be requesting your help again soon with another international action in support of Brazil's indigenous peoples. Thank you in advance for your support – this work would not be possible without you. P.S. We take no money from governments or big corporations so our integrity is never compromised. We rely entirely on your donations to keep fighting for tribal peoples worldwide. Please donate today. Without you, there can be no Survival.